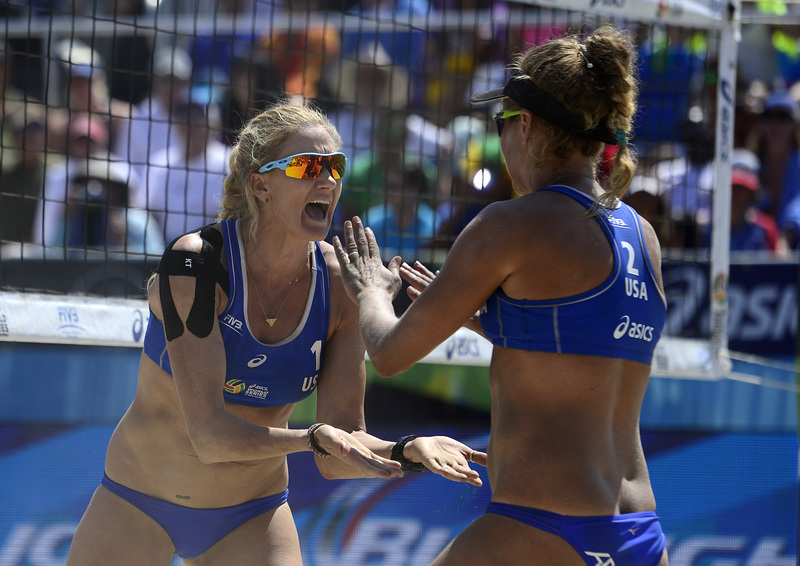 The 2016 Rio Olympics isn't the first time Team USA beach volleyball teammates Kerri Walsh Jennings and April Ross have played together. But since the games began, the pair has made headlines for their fabulous performances on the sandy courts. Though the two athletes have an indisputable chemistry, this dynamic duo hasn't really been playing for that long. In fact, Walsh Jennings and Ross have only been playing together for a total of three years. More specifically, they became official team members — on the same side of the net, this time — in July 2013 shortly after the London 2012 Olympics ended. According to SBNation.com, when Walsh Jennings' former partner-in-crime Misty May-Treanor decided to retire after winning three straight golds with her, Walsh Jennings, 38, knew she would need a replacement. In other words, the athlete was fully aware that she wasn't ready to follow suit in retiring just yet. In a storied and ironic discovery, Walsh Jennings chose Ross, 34, after beating her and Jennifer Kessy in the all-American tournament in the London 2012 final, where she reportedly said to Ross after the match, "Let's go get gold in Rio." And ever since that declaration, the duo has been making waves for their victorious performances. In just the past year, the pair earned numerous 2016 Olympic qualification medals, including second place at the Long Beach Grand Slam, third at the Fuzhou Open, and first at the Rio Grand Slam. Walsh Jennings is looking for her fourth consecutive gold at the Rio Games, and that win would make her the fifth woman to have four consecutive wins in the same sporting event at the Olympic games. And they have a good shot at it this year, as the Olympic pair is ranked third behind only two German teams: Laura Ludwig and Kira Walkenhorst, along with Chantal Laboureur and Julia Sude. Ross has been described as a powerful setter who can spike the ball by herself and Walsh Jennings is known for her strength around the net. Walsh Jennings is also known to have an indomitable spirit, and famously competed in the 2012 Olympics when she was five weeks pregnant, (something her doctors said was safe to do). Depending on how they perform on Tuesday night's semifinals, they might have a shot at making history.